Nutty fiber-rich whole grain brown rice and veggie-full salad to pack for lunch or to serve on the side with your favorite protein. 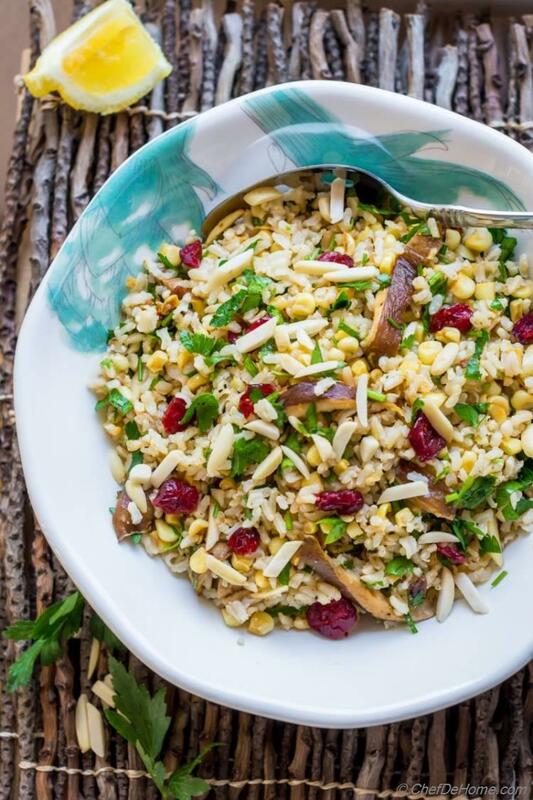 A brown rice salad like this vegan, fiber-rich salad with earthy mushrooms, sweet corn, crunchy almonds, and sweet cranberries is what makes me look froward to meatless diet days such as for Meatless Monday. Since we have more than one days in week when we don't eat meat and stick to vegetarian diet... Those days, I love packing hearty salads for lunch which are loaded with veggies and full of nutrition. Like this brown rice salad. Not only it is full of fiber... it has two serving of veggies with maitake mushroom and sweet corn, and lots of fresh parsley! Plus a lemony dressing that I has power to make everything delicious! 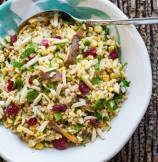 Without doubt lemon freshens up and brightens up this nutty rice salad. In fact, it even improves the flavor as salad sits in this dressing. Some lemon zest, lemon juice, olive oil and salt... These simple ingredients take rice flavor to new level. What else do I want for a dressing? I think, my inclination for lemon and rice comes from one of my favorite Indian rice side - Lemon Rice. If you have never tried it, I highly recommend checking the recipe. This is also great side/mini meal to pack for lunch. So today, I thought to bring to you this easy breezy recipe for two reasons: my love of brown rice and meatless Monday! First, love for Brown Rice! These days I'm obsessed with using brown rice in cooking. And it is not that easy. Most Indians are hard-core white basmati rice lovers and I have two in my home. (me and Vishal) lol! Recently I did a review of boil-in-bag Success rice. I brought few packages to try recipes and just fell in love with easy to use packaging and quality of rice. Now, this post is not a paid review but I must say, I'm using their Brown Rice so often. Even Vishal agreed to try and liked it. Second reason is meatless Monday. I often drift from this rule of starting Monday healthy because in my culture Tuesdays are meatless rather than Mondays. 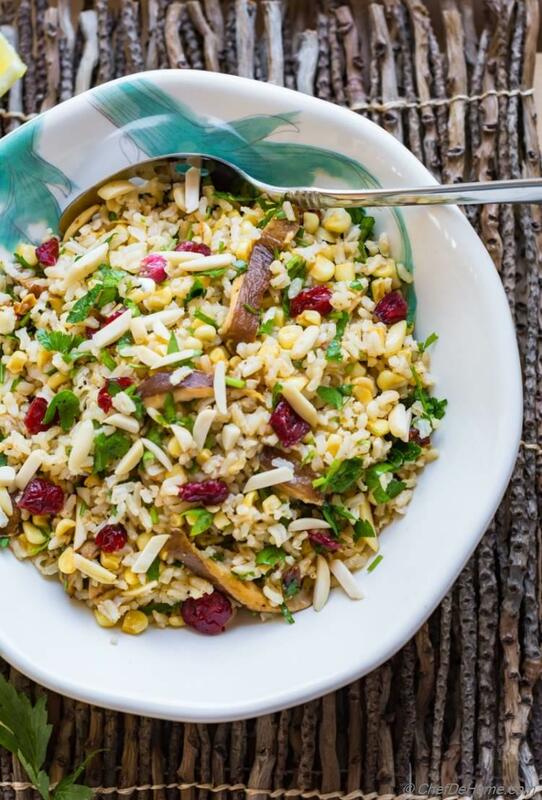 So, today I thought to follow the vegetarian Monday rule and share a delicious way to keep Monday healthy with this Brown Rice salad. Sounds good? In my home, such hearty vegetarian salads are often packed for lunch. 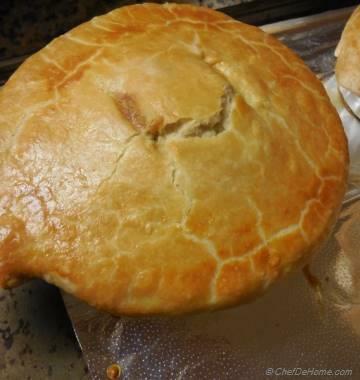 So, you can say this is third reason to share this recipe. I wanted to give you a simple, quick, healthy and veggie-full recipe to pack for your kiddos. Other than a touch of paprika which you can skip, everything in this salad is lite and suitable for kid's palate. Plus you can ready this salad, a night before. Like I assembled this salad yesterday while getting ready for weekday. If you follow me on Instagram, I'm sure you have seen a glimpse of this yesterday. Making this salad is super easy. By the time rice cook in a boiling pot of water.. I saute the mushrooms and corn in oil, garlic, sun-dried tomatoes, cumin and chili powder. 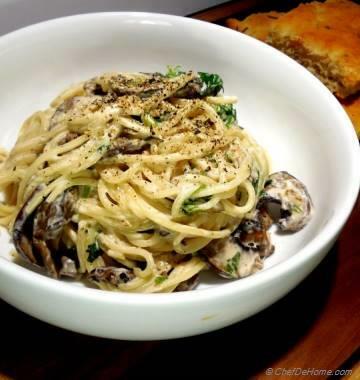 Sweetness of corn balances the subtle spice and complements the earthy flavor of mushrooms. Once veggies are cooked, I transfer them to wide bowl so that I can toss'em with brown rice easily. Once brown rice are cooked, I spread them on a plate to cool a bit. In meantime, I assemble quick dressing for rice. 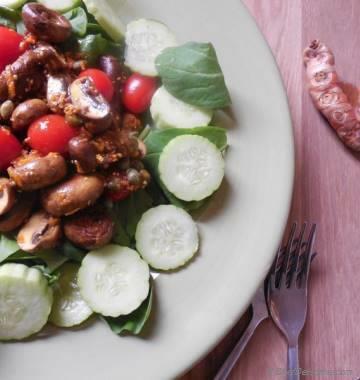 Toss everything together with silvered almonds, sweet cranberries and lots of fresh parsley and you have salad that can be served three ways! b) Delicious and healthy side for family dinner. On side note, I recently moved the location in home where I take pictures. Since days are long and sun is shining so bright... my existing setup was resulting in too bright pictures. So, I moved the location to low-light window... still experimenting with it. Let's see how you guys feel about the lighting of this picture? Too bright or too dull?? Love to hear your thoughts on that. Brown Rice salad, greens salad or meals in general... I'll find keep finding ways to share some healthy eats with you. Of course I'm looking forward to enjoy my Brown Rice Salad lunchbox today. :) I hope you get chance to make some soon! If you are a rice person? These easy rice recipes will pick you up! Total Time 25 minutes Prep Time 10 minutes Cook Time 15 minutes Difficulty Easy Yields 4 Cups of Salad Serves 3 Notes No. of servings depends on serving size. 1. Cook rice according to package direction. Once ready, drain and spread on plate to dry out access of moisture and to cool down. 2. In a salad bowl, whisk lemon, zest, and olive oil to emulsify. Season with salt and pepper and set aside. 3. Heat 1 tbsp oil in a pan, add minced garlic and sudried tomatoes with mushroom and saute for 3 minutes to draw put moisture from mushrooms, then add corn, chili powder, cumin powder, and 1/4 tsp salt. Cook until corn is tender (2-3 minutes). Remove in salad bowl. 4. Add cooked and cooled rice, chopped parsley, almonds, and cranberries. Mix well to coat rice in lemon dressing sitting at bottom of bowl. Taste and adjust salt and black pepper. Serve in salad bowl or pack in lunch box. Enjoy! Use long grain brown rice for salads. They hold their shape like pasta, are also nutty in texture which gives some bite to the salad. in instant Pot or any way you like. Welcome to Yum Goggle! We are following you on all your social media platforms and hope you will follow us back. We will do our best to tag you each time we promote your posts. Kelli at YG! thanks, YumGoogle! Happy to connect.